The general look of gaming headsets is changing from the super techy Air Traffic Controller appearance that we’re used to. When it came to gaming headsets that you could confidently wear in any setting, the only contributors in this market to date were LucidSound and SteelSeries. Every product in the LucidSound brand is designed to merge style and performance and the SteelSeries Arctis was SteelSeries’ nice rebuttal to that. However, Logitech, with their wide variety of gaming peripherals, made sure that they would not be left out of the fray in this budding market. 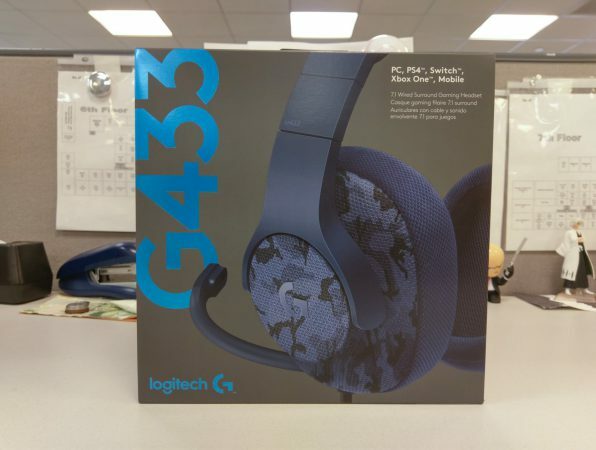 Enter the Logitech G433 Gaming Headset…. The G433 headset has a very calm yet attractive appearance, taking a base color and following through with it throughout the headset. There are four color design choices to go with: Black, Blue, Red, and (Blue) Camo. The outside of the earcups have a nice fabric finish, adding a nice pop to the overall color and appearance of the G433, depending on which one you’re looking at. The headband is a combination of plastic and metal, where the metal band extends out from under the plastic when adjusting the G433’s ear cups. As for the pads on the ear cups, the choice is yours whether you want use the default mesh pads for breathability or the microfiber pads for a bit of a different feel. Both ear pad pairs are included as well as a nice assortment of accessories to ensure that the G433 covers all of your listening and travel needs. Out of the box, you get the G433 headset, the aforementioned pads, a mobile cable with imbedded mic, a gaming-centric cable with volume and mic muting controls, a removable boom mic, a PC Y-splitter, a USB sound card, and two travel pouches. Starting with the accessories, this indeed is an impressive package for $99.99. The mobile cable houses a media control button for handling your mobile device’s media and phone calls. The PC cable, fully aware of its generous length, has an embedded cable manager for bundling its excessive bits. This simple add-on worked nicely, making me wish that it was included on the mobile cable as well. The mobile cable ran a bit longer than I’m used to, causing me to stuff excess wiring in my pocket as I used the G433 on the go. Still, the mobile cable’s imbedded mic as well as the boom mic’s removability allowed the G433 to be an excellent mobile companion. Adding in even more portability, I especially liked the inclusion of the smaller travel pouch within the larger one. The smaller pouch allowed for easy storage of all of the G433’s smaller bits, like the removable mic, each of the cables, and the Y-splitter. The larger pouch snuggly kept everything together, housing the G433, the smaller pouch, and the replacement ear pads. As a nice aesthetic touch, the pouches even mirror the print and color of the headset it was designed to bundle. As for the G433’s comfort, the headset itself is exceptionally light, which worked well with combating fatigue. However, I felt that the headset started off as slightly too rigid, encouraging me to do some mild stretching out of the headband. It didn’t take too long to break it in though, and with the microfiber earpads, the G433 had just the right overall feel. Now, that isn’t to say that the mesh pads were uncomfortable in any way. I simply tend to gravitate towards a tighter acoustic seal than I feel that I get with mesh. Thanks to Logitech’s inclusion of microfiber earpads as options, the G433 ended up feeling just right for those longer sessions of play.